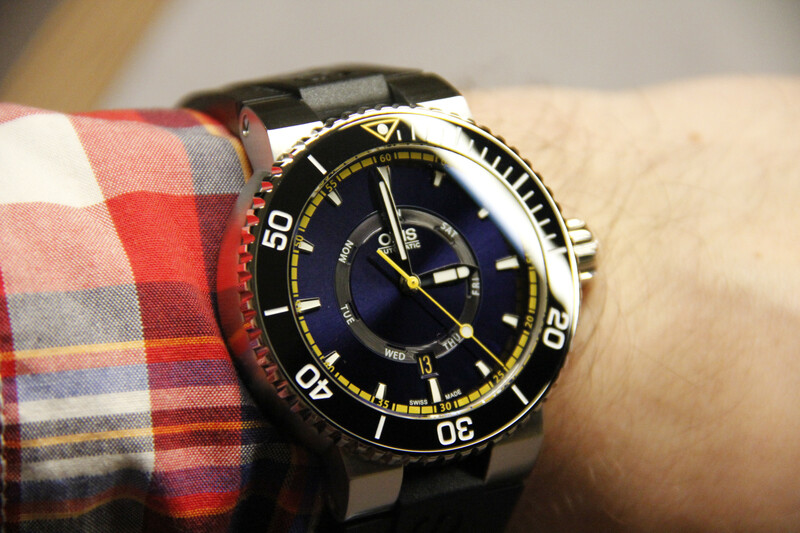 Ok, this watch is out on the market for several months, and now we are ready to share with you review. This article is not a few days photoshoot, no, we were trying watch in everyday wear. 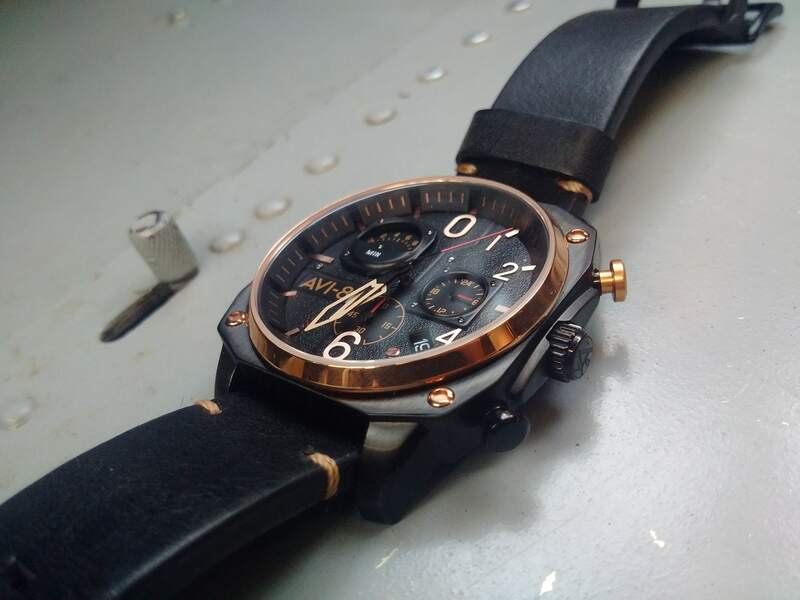 New Avi-8 Hawker Hunter is quite unusual watch, read on to know how it fits for casual use. 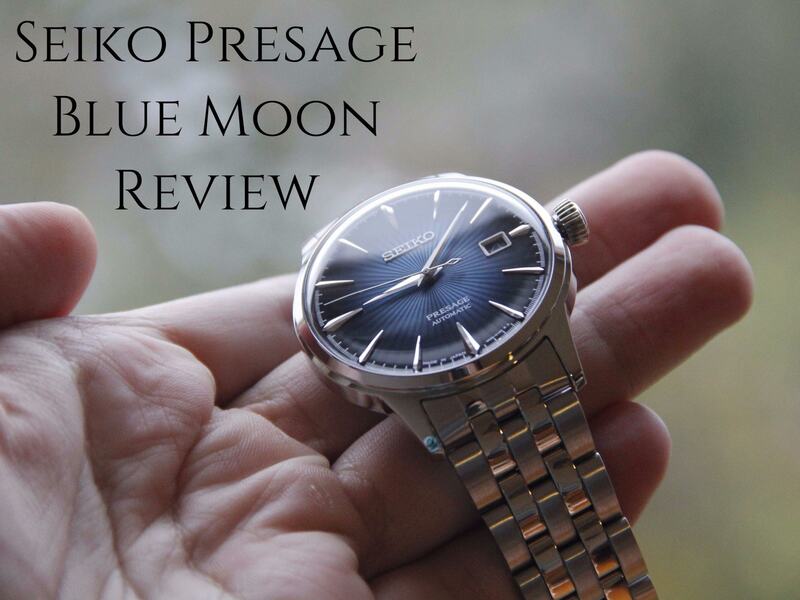 By the way, here you can read review with another watch. 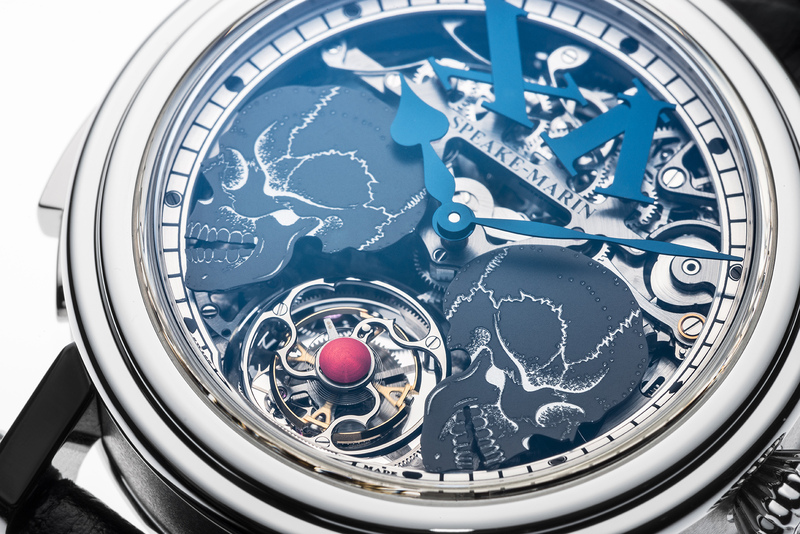 Well, no surprise here, watchmaker’s name hints on the main topic, which inspires creators – aviation. 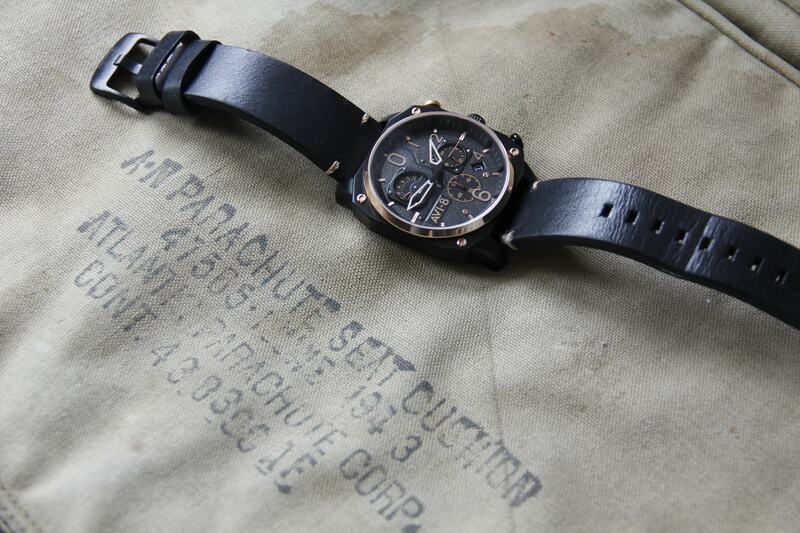 Today’s watch is not an exclusion from this rule and builds its image on plenty of airplane things. Nevertheless, I have to say that I was quite surprised when I saw first photos of this model. 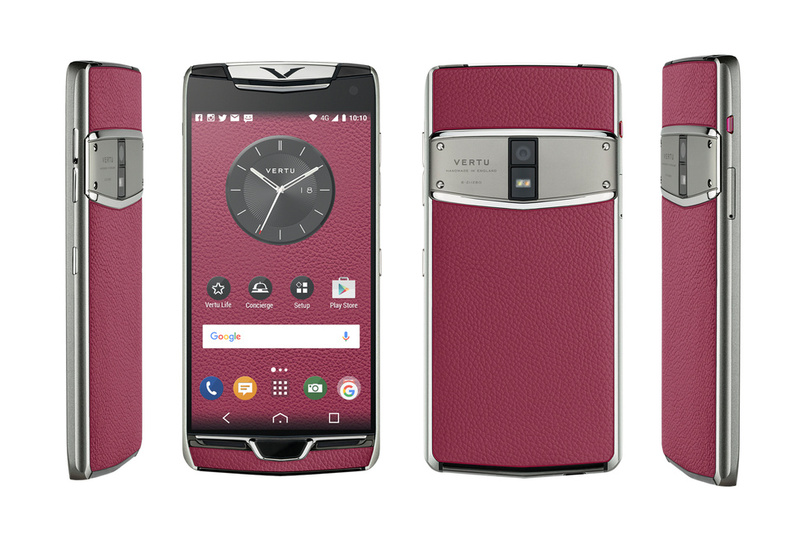 It’s definitely masculine, and it looks more sophisticated than previous releases from the same manufacturer. Here I would like to make small note about real Hawker Hunter. This airplane is quite old, but notable because it broke speed record. Avi-8 decided to commemorate this beautiful bird and issue line of the models named after supersonic jet. Now let’s take a closer look at what it has to offer. 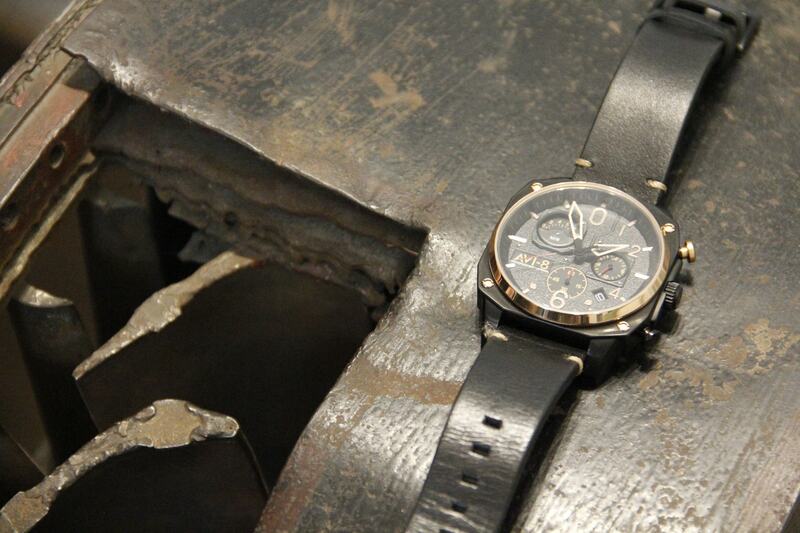 I would like to dedicate separate section to design of this watch. 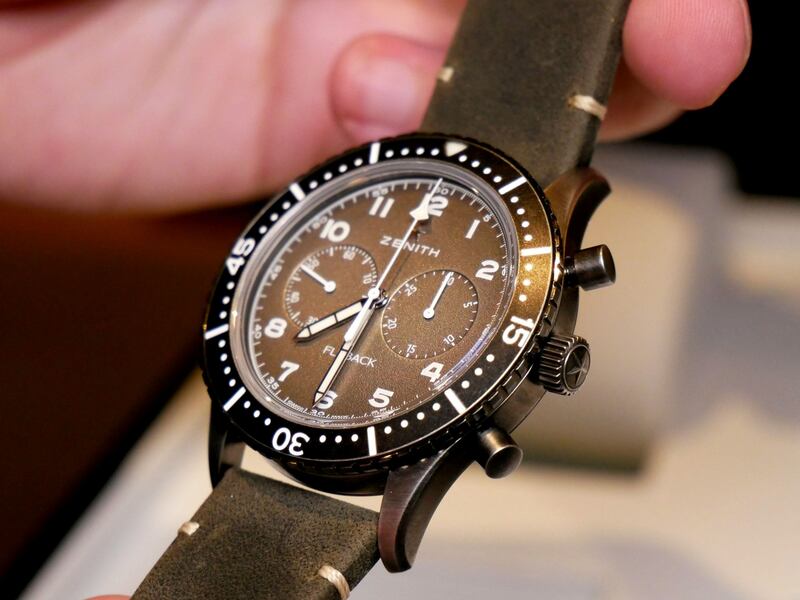 As I wrote before, all previous models from Avi-8 were quite calm in their styling, but today’s model just screams with aviation. Straightaway I have to say that there are several colors available, and grey looks the most impressive. Nevertheless, we have black-and-gold combination for the review. Should I say that I was baffled by this color composition. While grey looks like it was torn straight out of airplane, black is a bit more “fancy”. As you can see on the photos, golden elements include ring around top glass, several screw and pusher. 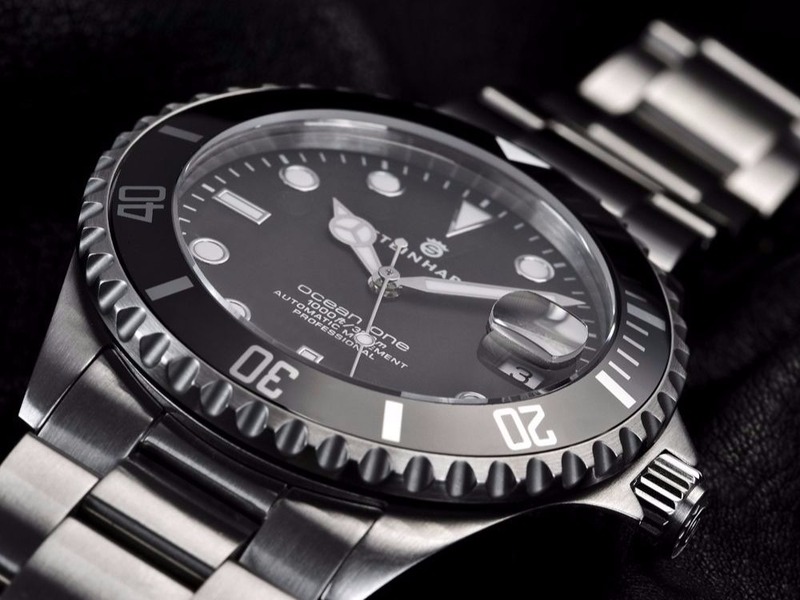 Now, keep in mind that there are several other color combinations available, mainly with black dial, so I have no doubt that you will find something suitable. 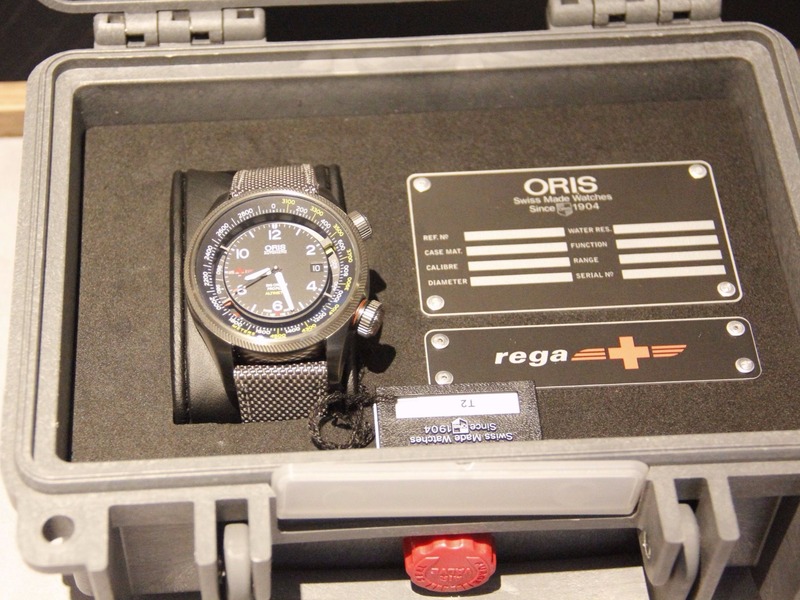 One small suggestion – what about configurator for such watch, so that future owner can build his own color mix? I would say that watchface dominates whole design. 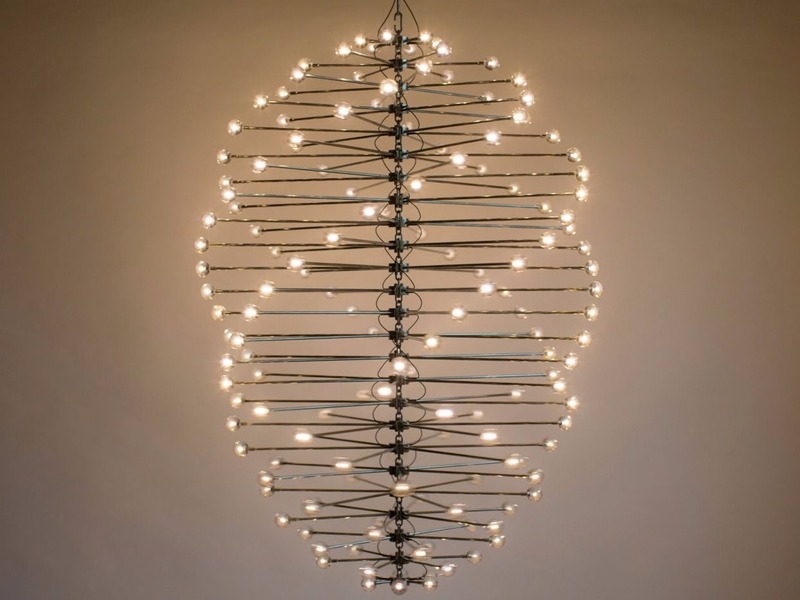 This is a truly impressive approach to design such common thing. 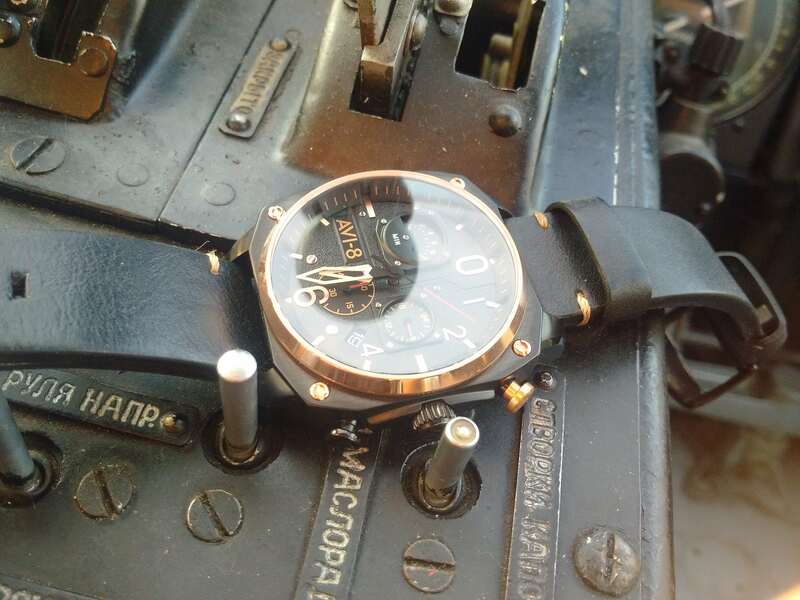 Some of the previous models from the same company featured subdials copying gauges on airplane. 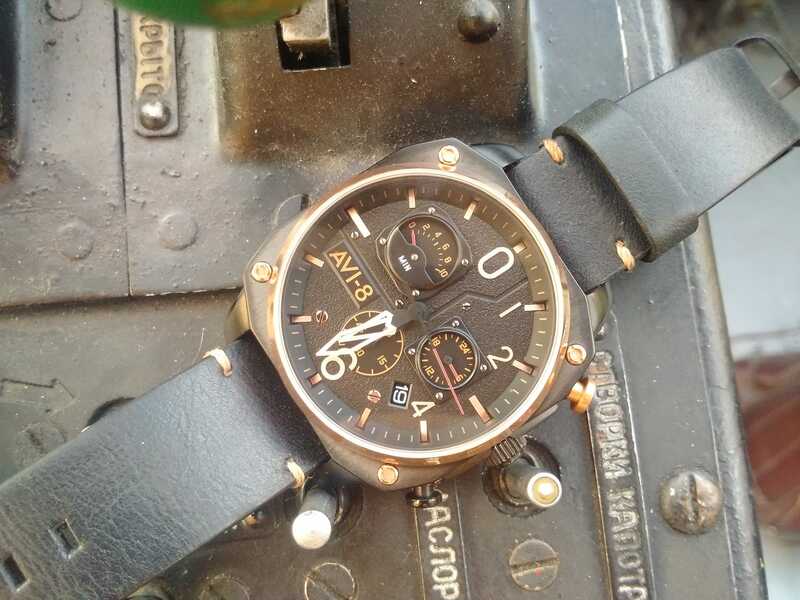 Avi-8 Hawker Hunter takes it to the whole new level. First of all, forget about symmetry. Assymetrical design is noticeable from the first sight, and it’s actually a good feature which catches your eye. 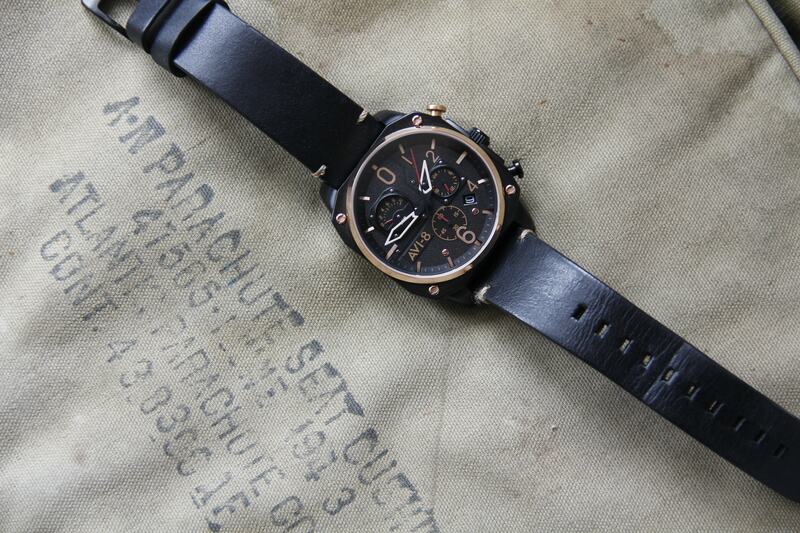 Surprisingly, it doesn’t make watch more difficult to read. Moreover, those subdials bring “volume” to the dial, so it doesn’t look flat. Photos don’t convene even half of “coolness”, so I would recommend to check model personally. Hands might look gold, but they are actually covered with luminous material. 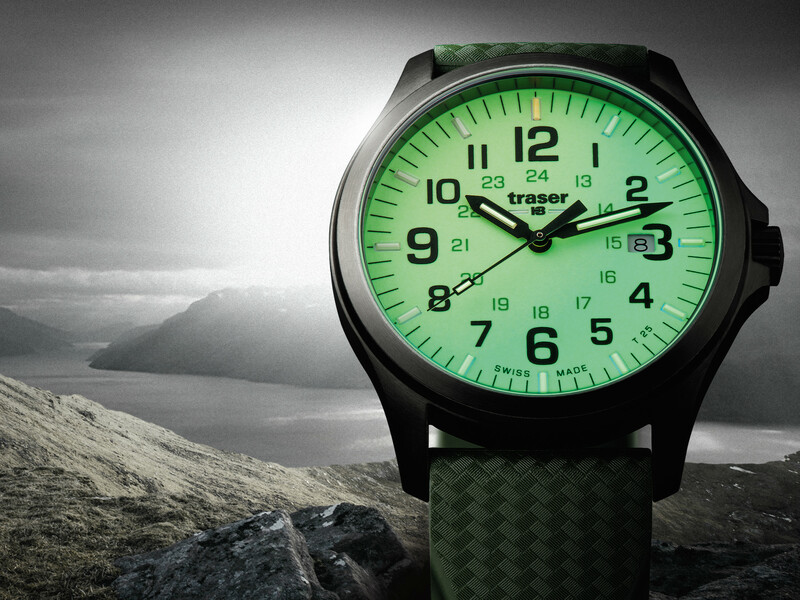 Here I have to say that you shouldn’t expect enormous lume, which can serve as flashlight in the dark. No, it shines just enough so that owner would know time. 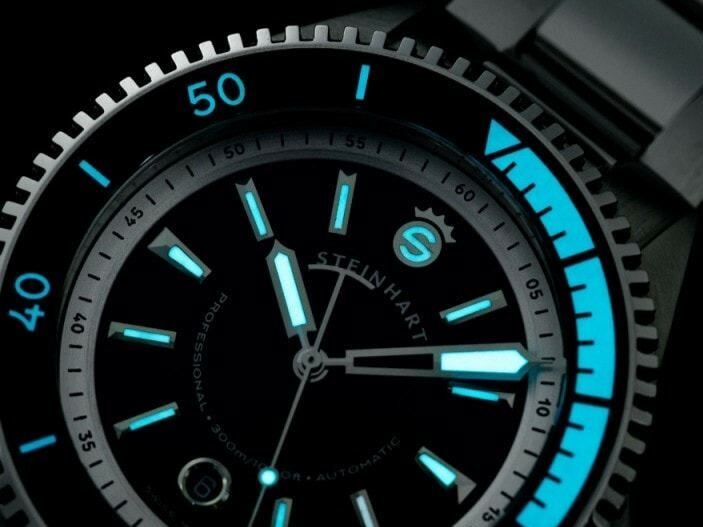 Oh, indices are not covered with lume, what adds a bit of challenge to guess right hour. Well, at least hands are quite big, and it’s easy to know time from the first glance. 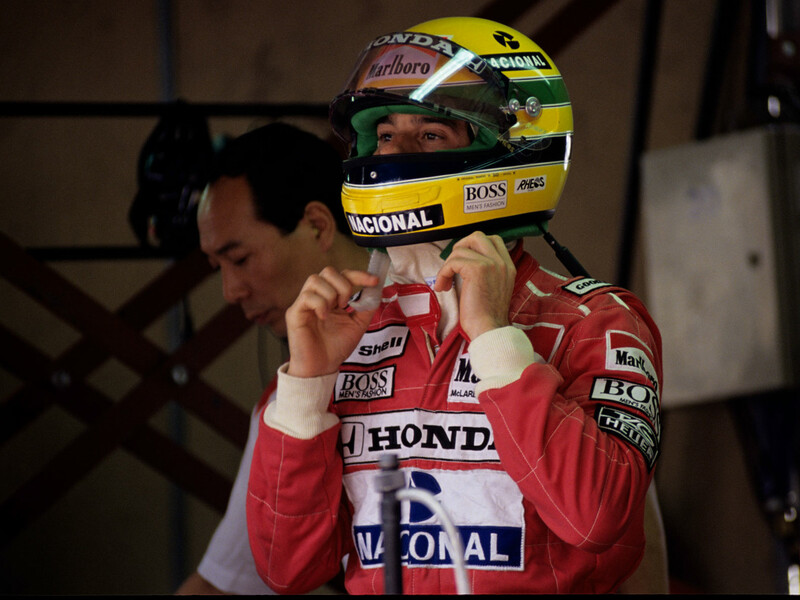 Note that their middle section is cut out, what helps to read subdials even if they are “covered” by main hands. All hands on subdials and seconds hand are covered with red color, there is no lume on them. 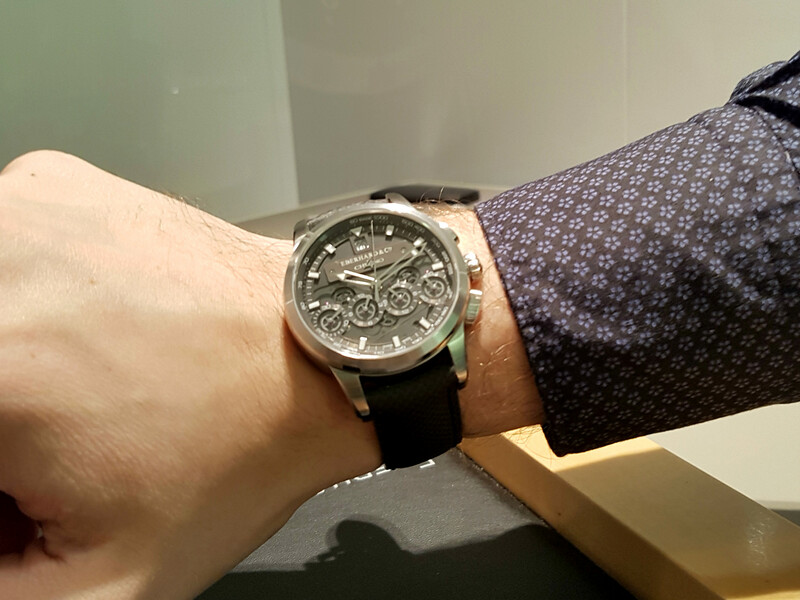 Flip over the watch – and you will see silver caseback, which features manufacturer’s logo. 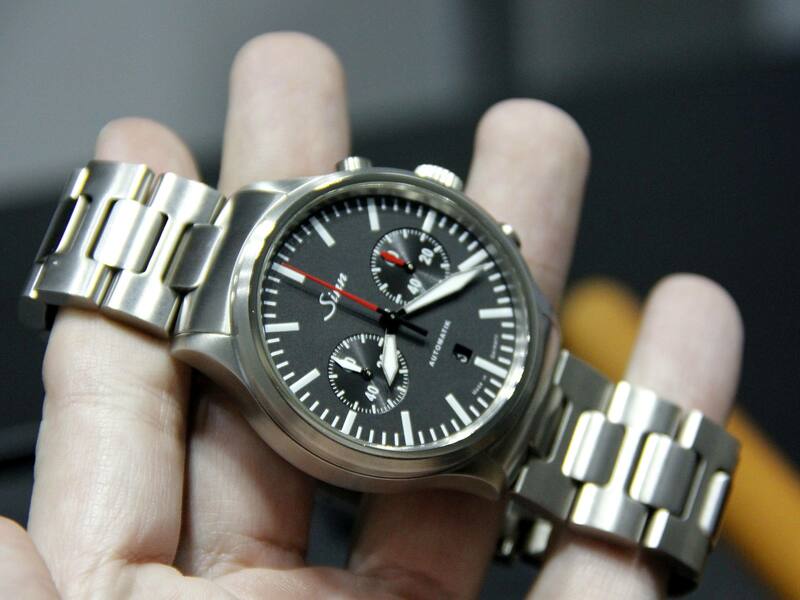 Well, this part is not visible while on your wrist, so no worries about silver finish. 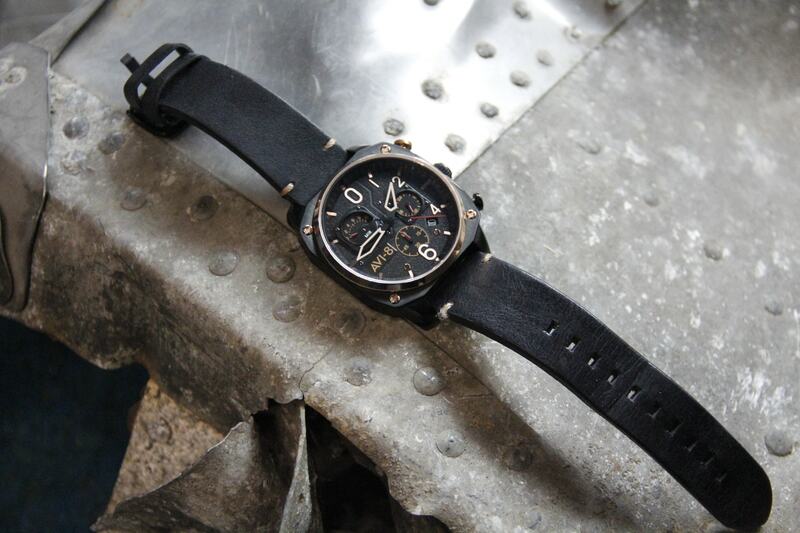 Avi-8 Hawker Hunter has slightly bent lugs, what helps watch to fit your wrist. In other words, it sits flush despite being 45 mm big. There is no mention about glass material, but I would guess that it is a mineral one. Still, as you can see, there are no scratches after several months of use. The only noticeable thing – glare on some photos.There is no denying that under some angles this part will reflect sun and make it difficult to read time. 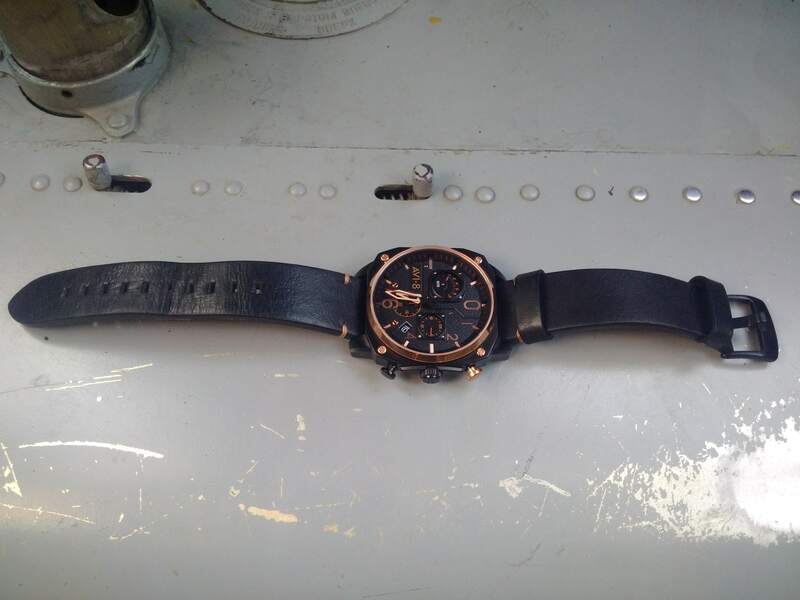 While original Hawker Hunter needed impressive Rolls Royce Avon jet engines to break speed record, today’s watch is bit more humble inside. 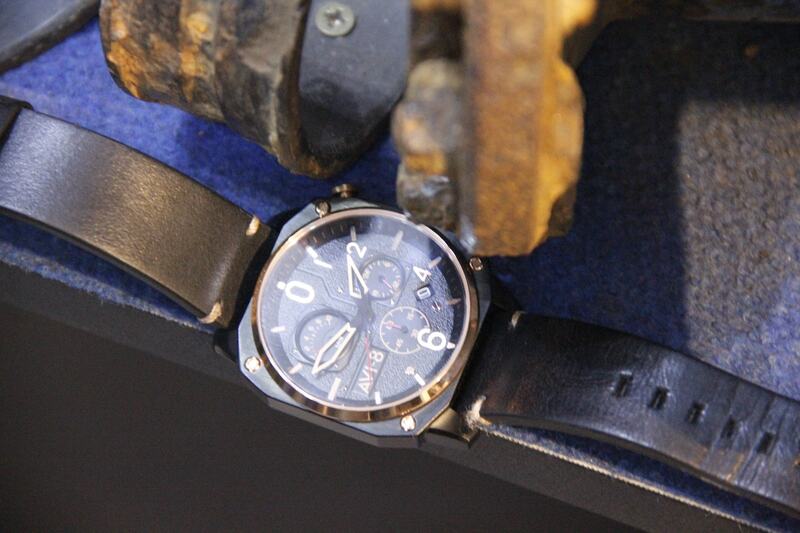 Chrono is based on Japanese quartz movement, which is more than enough for everyday use. 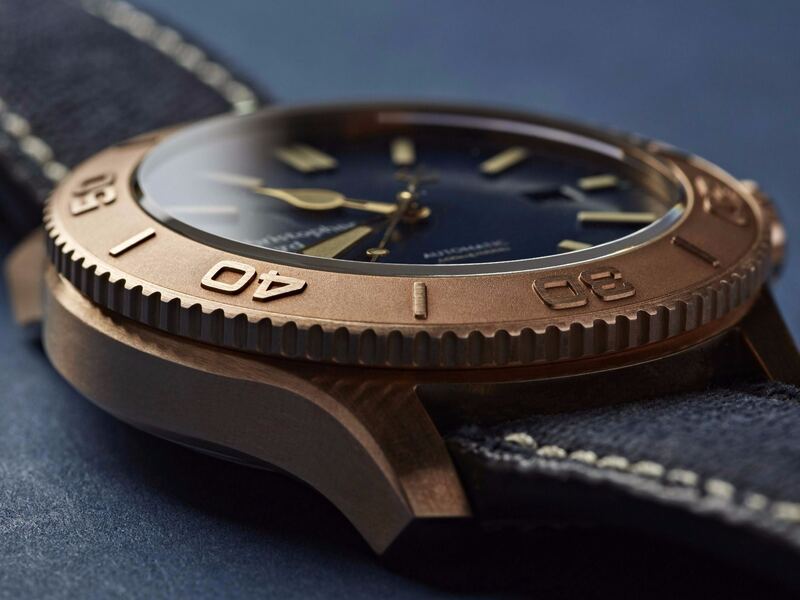 Case ensures 5 ATM water resistance, so at least you don’t have to be worried about splashes. 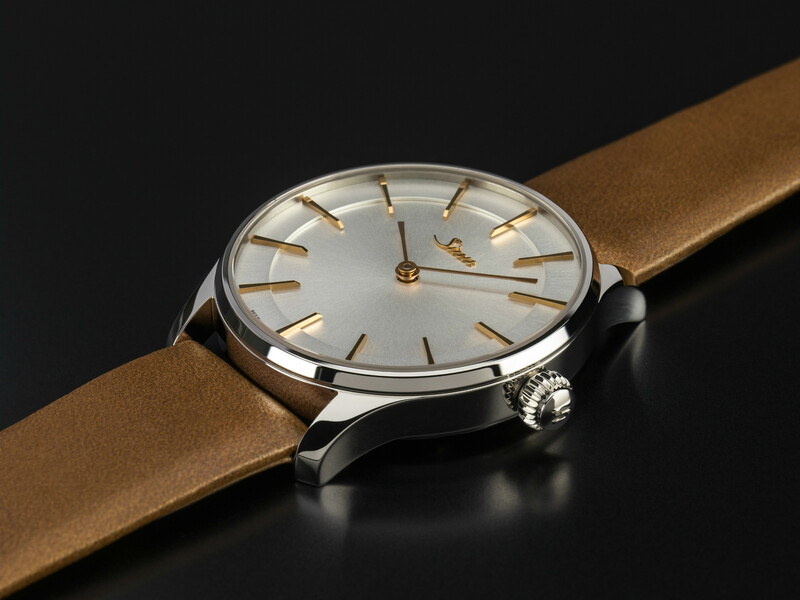 Those, who want to complain about quartz – just think about price increase with automatic movement, and you will understand reasoning behind. 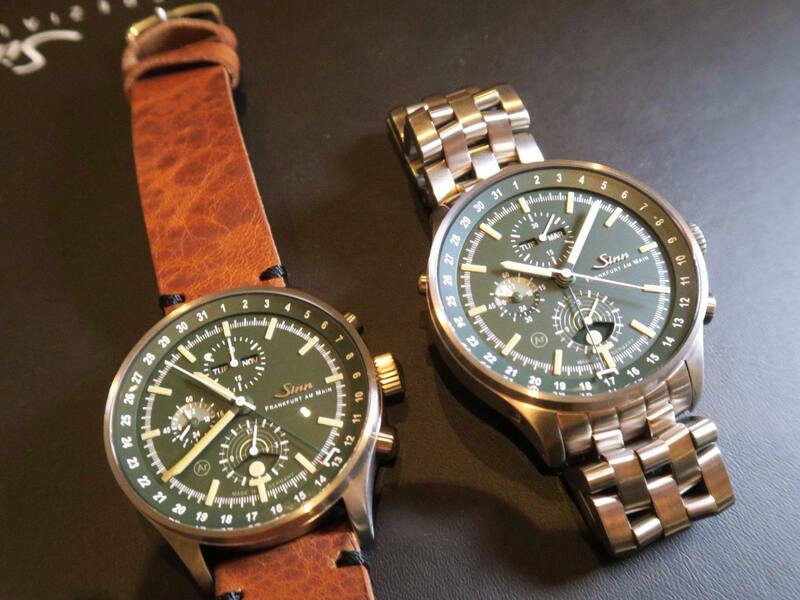 All Avi-8 Hawker Hunter watches come with leather strap. Well, word “leather” is a huge overestimation of the material used. I am quite sad to write this, but watch would definitely benefit from better strap. Yes, it fits nicely, but it doesn’t hold to overall quality level, and I would rather replace it with textile or leather nato strap. 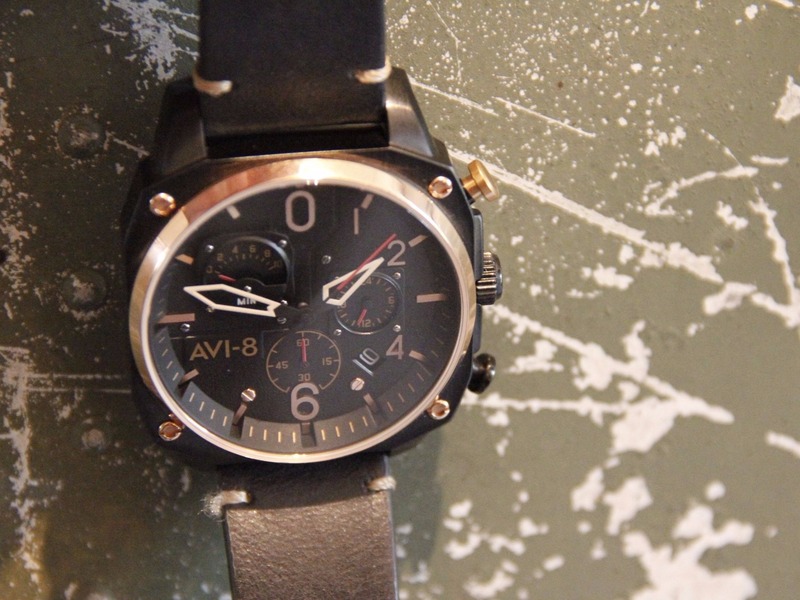 By the way, on the black buckle you will find another Avi-8 logo. Several month of use made this strap to divide into two halves, what only supports my statement. 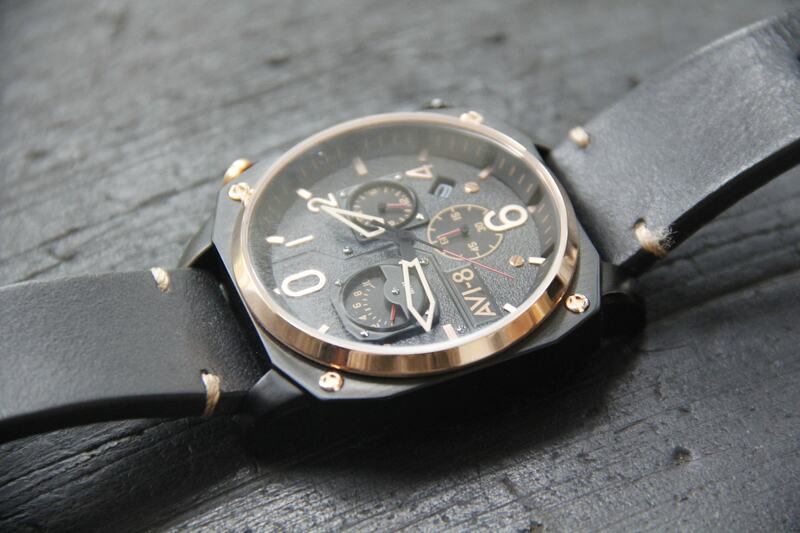 Just order additional strap, and you will be happy to wear this watch. 😉 Oh, there are no scuffs on the buckle, and it’s impressive for me. 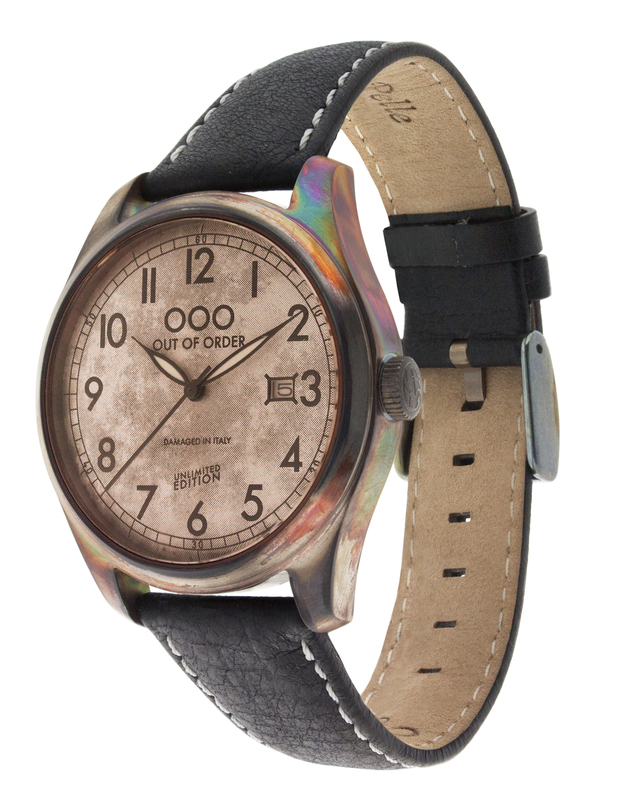 As I wrote before, my intention was to try this watch in everyday use. 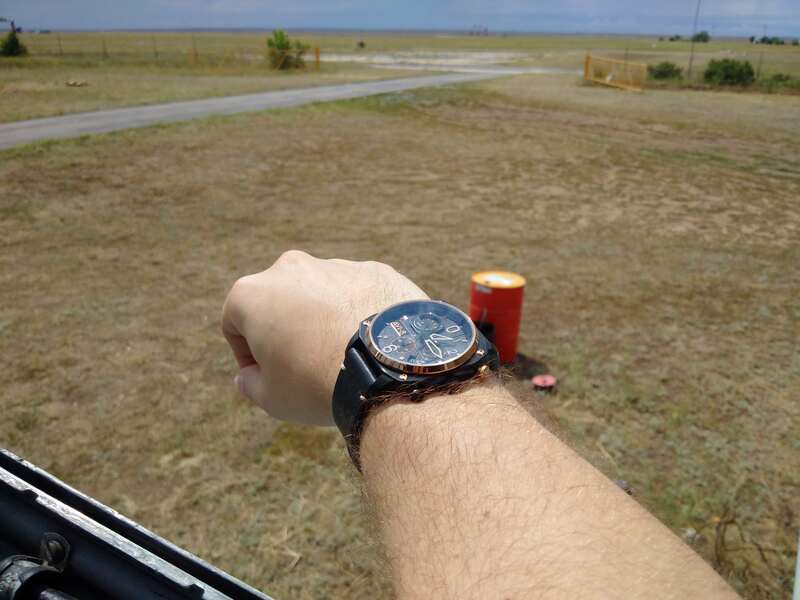 My Avi-8 Hawker Hunter traveled to several countries, endured several heavy rains, crazy hot weather and few other uncomfortable things. Still, it’s alive and looks like new. There is no scuff on the black case, and I would write it down as an advantage. Strap surrendered to pressure and started to divide into several layers, but that’s not serious. 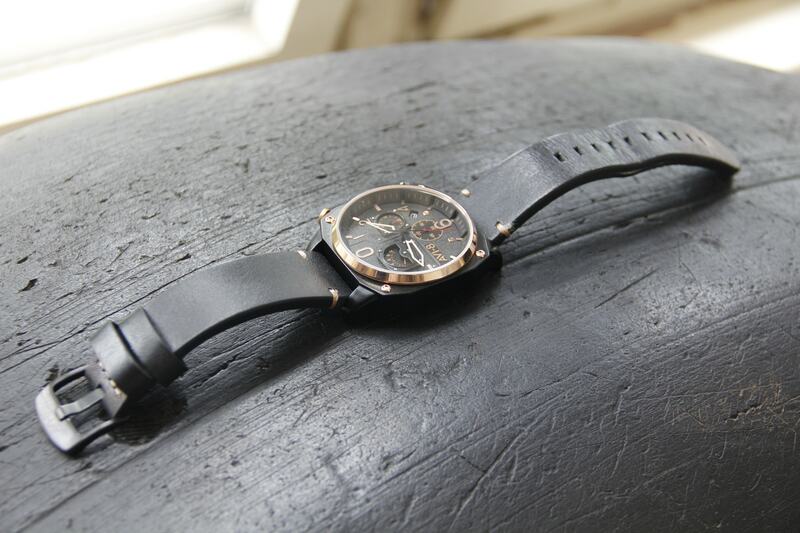 We can consider it as a good reason to get better leather strap for this timepiece. 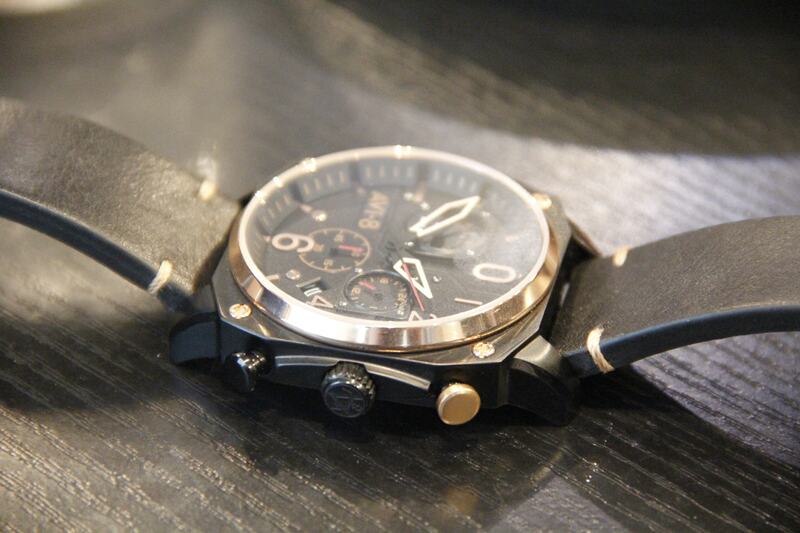 Otherwise watch is not to heavy, fits nicely on my wrist and was easy to wear everyday. Even in black-gold combination it looks nice both with t-shirt or official white shirt if you are brave enough to combine them together.